It is amazing how many curious, disapproving looks you get when you're out in public with a child who is sporting a shiner. Mary's black eye gets more colorful every day and the looks and questions keep coming. Of course when someone asks her what happened to her eye, she gets all shy, cringing from the extra attention. And answers sheepishly: "I fell." She doesn't give them any details. Like the fact that the she and her sisters have been hanging out in the upstairs bathroom, because when the door is closed it gets really warm in there. And they've been bringing all their papers and books and crayons and toys into the bathroom. And she tripped on something and slammed that cute little cheek bone into the toilet. You know, little details like that. Oh well. I have to admit it's kind of cute. And I've enjoyed photographing its colorful progression ever day. I've been getting some emails lately about people wondering if I'll be having a mini-swap #4. It has been on my mind and I'd love to know if there's still interest out there. I'd be happy to host again, though I think I'll make it a little smaller and easier to manage, if there's enough interest to do it again. Would you leave a comment or drop me an email if you're interested? If you're new to the mini swap idea, you can read about it here. This isn't a sign-up or anything. Just seeing if there is enough interest. My computer crashed right in the middle of the Little Bird giveaway. I really apologize for not announcing a winner. And for some reason the post went up twice on my blog. So I combined all the comments and randomly chose a winner from everyone. tshirts/dyes irritate her skin. These sound perfect and soft! Christy, please send me an email with your contact information so I can pass it on to JoAnna! Oh yes, we know about the shiners. It was just about a year ago. We’re always up for miniswap. We’d love a miniswap. Sounds like so much fun. We had this problem when our Mary had a cast on her arm. For some reason people stare and not in a nice way and I couldn’t believe how many people would ask her what happened. We are in for the swap. I was actually just thinking about it yesterday. I’d be interested, my kids are old enough to do quite a bit this year! Miniswap, yay! I have a two year old who would love to make/ create a magic package for someone else. My husband gave me a black eye a few years back (totally innocently and accidently). But my boss at the time was ready to confront him on my behalf! And yes please to the miniswap. I met one of my favouite bloggy chums through the last one. We are SO VERY interested in the mini swap! Yay! I would love to do the swap if you’re up for it. We would love to do a mini swap again. It was fun! I have enjoyed the mini-swap since it’s inception and would love to participate again. DEFINITELY interested in another miniswap. The miniswap sounds like such fun!And what a lovely way to find a home for the many, many crafts keeping us busy this long, snowy winter. Poor thing! You’d think people would understand that children fall and bump into things all the time! When my son had pinkeye, I felt the same way! He looked terrible! A mini swap sounds awesome count me in! Yay! I finally won a giveaway! My two girls are terribly excited about their new shirts! This was a great moment in an otherwise dreary Monday! Ouch! I hope that sweet little eye gets better soon! Never done it before, but would be interested. Love the concept! Very much in line with my families sensibilities. 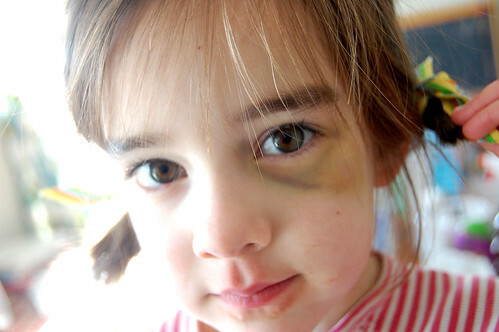 Such a great shiner, we had a similar one coupled with a row of stitches to my girl’s cheek after a bed-bouncing incident! No-one messed with her for a while! My daughter and I live with a bunch of boys, so this would be fun to do together. Would I be able to sign up twice? Once for my daughter and once for one of my sons? (I have 4 kids and I’d be hoping to do it for the two middle children (poor middle children, getting lost in the middle)). My kids were just telling me that wanted pen pals….I think this miniswap is such a great idea. If you do another start one Id love to join. I would love to do a mini swap! Oh yes the looks and the feeling you get as the mother to make excuses about it or feel weird about it when in fact your kid is just clumsy. My youngest son has sported 3 and still he has yet to learn: that when running you should have your face/eyes in the direction you are running and not looking over your shoulder to see if, in fact, your older brother is chasing you. A swap sounds like great fun, I would love to participate. I would LOVE to do this! Sounds like a great little project for my 2 year old and I.
I would be interested in getting in on a miniswap as well. We really enjoyed the swap last year and would love to add a little more crafting to our winter days!